Policy Watch has learned that, with a pivotal vote set for Wednesday on a controversial bill legalizing achievement school districts, state House leaders have made a last-minute addition to the voting committee in the bill’s co-sponsor, Rep. John Bradford III of Mecklenburg County. It’s important news because legislative observers tell Policy Watch that they expect Wednesday’s vote to be extremely close. Here’s a House document confirming the committee change Monday. A phone call to Bradford’s office was not immediately returned Tuesday. The legislation, which emerged late in last year’s session, would pull some of the state’s lowest-performing schools into one statewide district, which could be operated with charter-like flexibility or handed over to for-profit charter operators to manage. Performance in a similar district in Tennessee has been lackluster, according to a recent Vanderbilt University study, and parents have been highly critical of wresting control of their schools from local school boards. Meanwhile, public school advocates warned of potential financial complications with the model for local school districts in March. But the bill’s chief proponent, Rep. 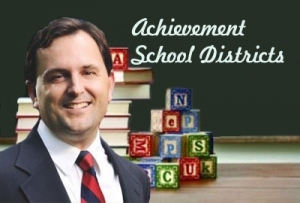 Rob Bryan, another Mecklenburg County Republican, has said he believes it could be a boon to some long-struggling schools. Yet, as a window into how close Wednesday’s vote may be, the bill has earned a cool reception from GOP budget leaders who question whether the state can afford the reform, pointing out Tennessee used a $500 million federal grant to jump-start its program. As N.C. Policy Watch reported last year, lobbying for the movement was financed by Oregon millionaire and conservative private school backer John Bryan (no relation to Rep. Bryan). Stay tuned to Policy Watch for updates on the bill.